Kalithies The village of Kalithies offers narrow alleys and numerous monuments. 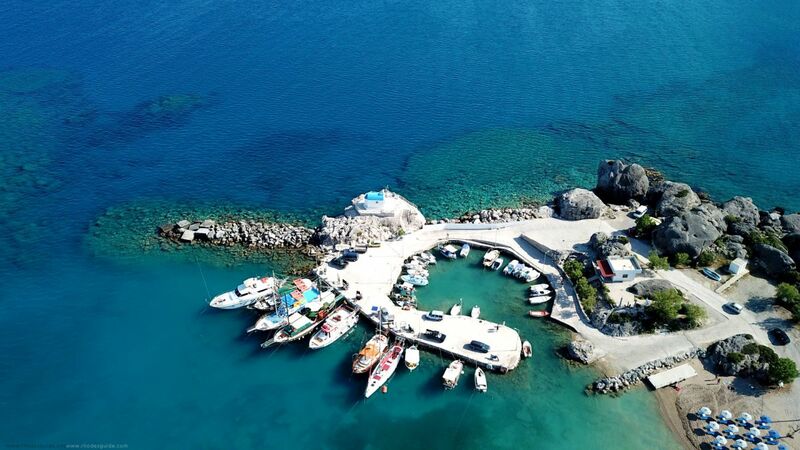 Kalithies, which is located on the north-west part of the island, 15Km from the city of Rhodes, belongs to the municipality of Kalithea, along with the villages of Koskinou and Psinthos. 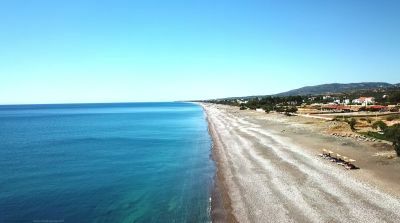 Kolymbia (or Kolympia) is an organized, mostly sandy beach, but by no means as crowded as the neighbouring beach of Faliraki. The hotels in the area are mostly preferred by elderly visitors and families, so the atmosphere in the entire area is somewhat relaxed. 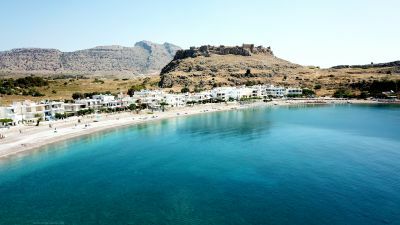 The favourable location between Lindos and Rhodes City and the child-friendly beach have made the street village a sought-after destination on the east coast since the 1990s. Despite the many hotels, Kolymbia is relatively quiet even in summer. The 2 km long, straight eucalyptus avenue at the edge of the wide, flat Afandou bay leads to an extensive, very beautiful (but narrow) and clean gravel-sand beach in front of an impressive rock scenery. The village on the mostly dry riverbed of the Loutani was founded in the 1920s, when the Italians brought about 30.000 colonists to Rhodes and built new settlements on the coast. The large church with the striking Campanile and the administrative building (today an old people's home) on the expressway date from this period. Behind it, at the beginning of the avenue, lie the fenced foundations of an early Christian basilica with a mosaic floor on the right. The ruin testifies that the beach area was already populated in ancient times. The two beach bays south and north of the rocky cape Vagia are beautiful bathing places and also popular as excursion destinations. In the north (left side) is the harbour, followed by a shallow sand strip with some rocks, in the back area tamarisks provide shade. On the southern side there is an open sandy bay, which drops a little steeper into the sea, and there are often stronger waves. The bay at the cape serves as a harbour. 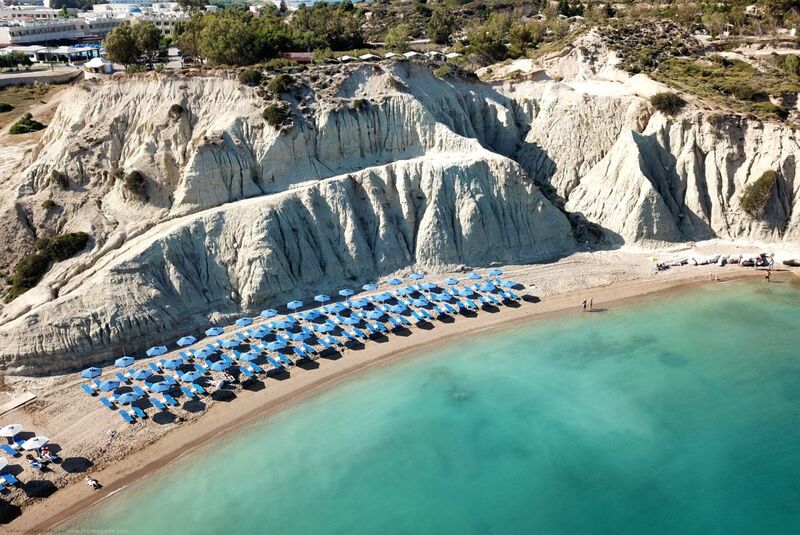 Looking for a hotel in Kolymbia (Kolympia) or Rhodes? 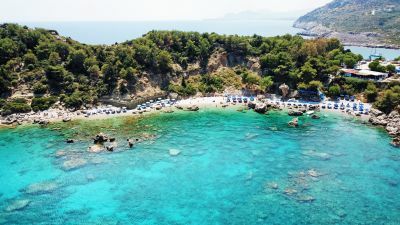 Check the following deals and special offers for hotels in Kolymbia (Kolympia) and Rhodes!